My recent inspiration hasn’t translated itself to the keyboard. It took a new project and a day or so of much-needed rain for me to get up the desire to write about what I’ve been doing. My pictures are not exactly sparkling, because the weather was rather dull today (a bit like the photographer). 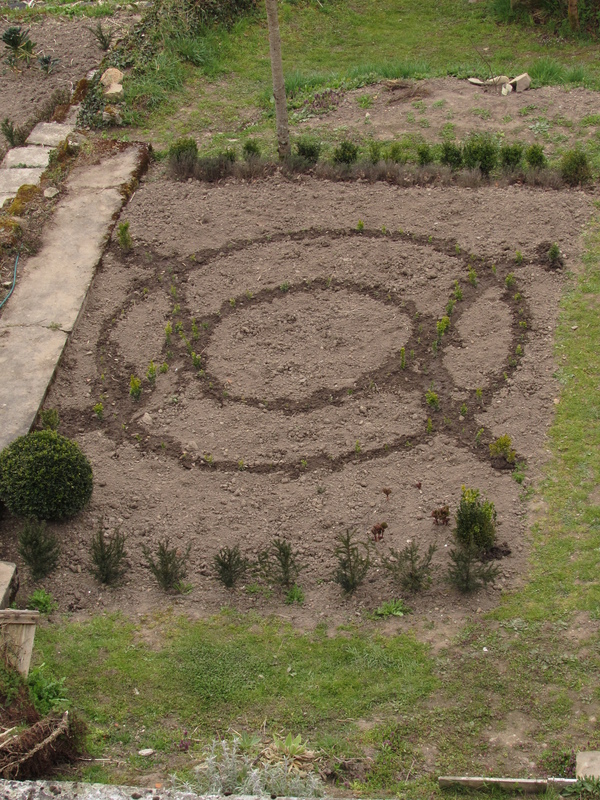 Yesterday I finally began to set out the knot garden I’ve been planning for a couple of years. The box cuttings were taken from my existing box hedges in the garden last June and simply thrust in little bundles into the garden soil of the cold frame. During the heat of summer they had the protection of a small poly tunnel to stop them drying out. I’ve been amazed at how well they’ve done (although still pretty titchy by anyone’s standards). I didn’t have enough to finish my chosen pattern. It’s not – forgive the pun – a ‘true lovers knot’ (click on the link here for images of that design), but a more angled geometric design that I think will suit the site well. I took some pictures from the little balcony of our guest bedroom today and the fact that I had watered the plants in shows the design off perfectly. 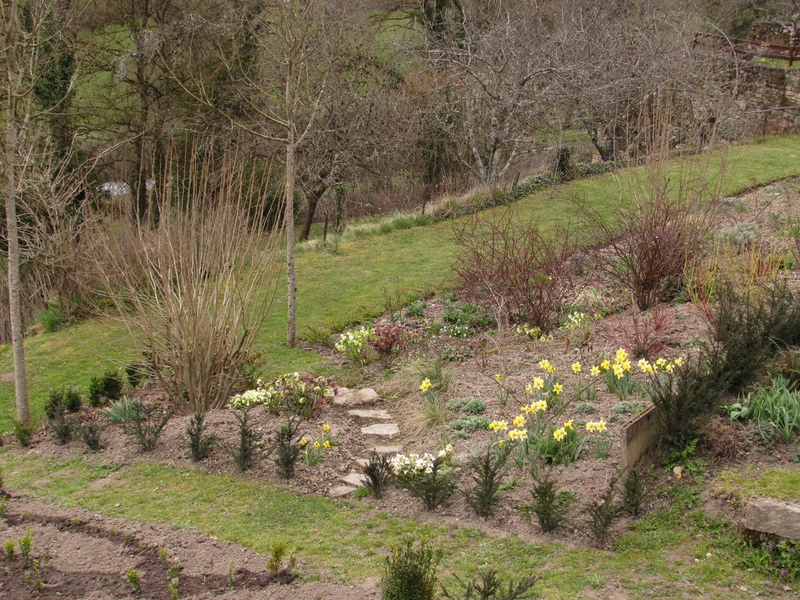 Now I’m feeling inclined to carry on this year and finish it, by dint of a method that some gardeners have used, but that I originally felt might not work on our hot slopes. In June, since I’ve nothing to lose, I’ve decided to direct-stick cuttings to finish off the little boxy bits in the corners of the design. The pattern below is is how it should look in the end (with a larger central circle). But I’m also going to do cuttings in the cold frame, since I’ve any amount of use for box in the garden. I’d like to add some topiary shapes, particularly in holly. Infilling? Not sure yet, but we thought originally to use peonies and summer-flowering bulbs with some foliage colour like artemesia, santolina, lavender. I think (like the design itself) it will be ‘make it up as you go along’ – but given that tulip time is just around the corner, I’m feeling intense yearnings tonight. Now that I’ve learnt to handle box blight better – not to mention the fact that a fungicide for amateur use has just been introduced, according to my February issue of The Garden – I’m allowing box to take hold of my imagination. 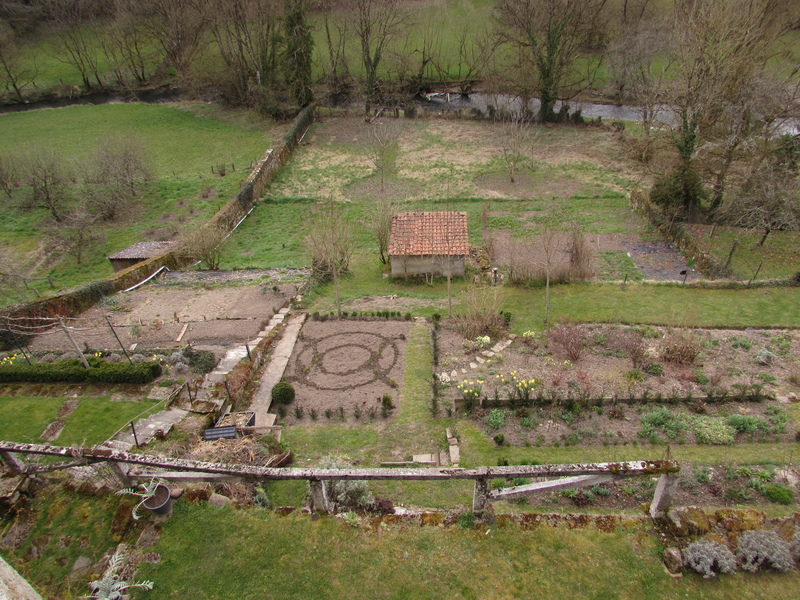 I knew there was a reason we bought a sixteenth century house … On the other side of the path from the knot garden (which I’m also calling a ‘winter garden’, since in harsh winter weather it may be almost all we see of the garden from the house) is the ‘wild winter/spring’ garden. It’s starting to come together, although I still haven’t enough ground cover to protect the clay soil from harsh summer sun. I’ve planted a silver-foliaged lamium, purple ajuga, epimediums, comfrey, vinca, and so on – I’ll split them up and spread them around. A little Lysimachia nummularia (Creeping Jenny) given me by a friend is very useful, but is already starting to assert itself a little too much. 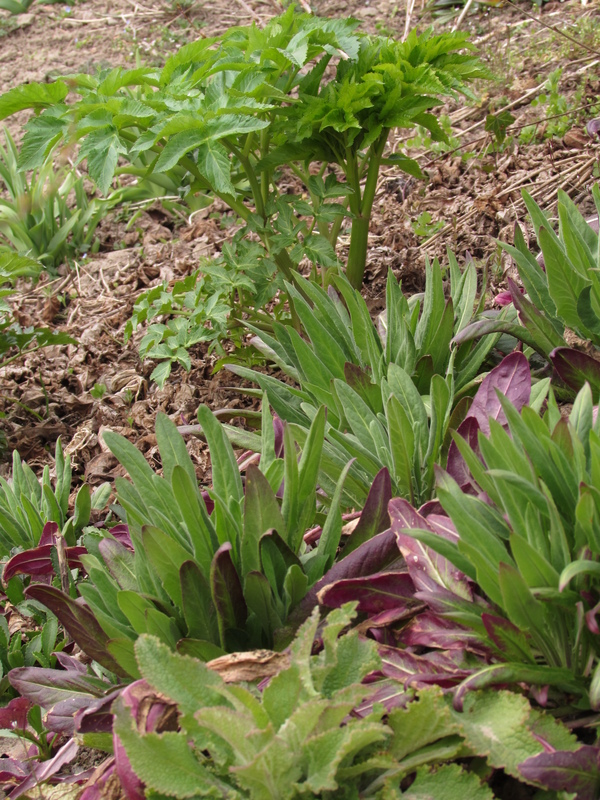 And a nice surprise to find that my ground-cover plantings have all survived a very wet winter. I had fears for the Lamium maculatum ‘Mega White’ (couldn’t get rust-resistant ‘White Nancy’), but it has its toes in now. It’s not that easy to find plants that will take lightly shaded, but still hot, conditions on a heavy clay soil that is either almost too wet to work or dried hard like concrete. I’m also considering bergenias and I have small pots of Mileum effuseum ‘Aureum’ (Bowles’ Golden Grass) and Corydalis solida to plant out. Both came from my mother’s garden in Scotland and, although C. solida is pretty tough, I’m not sure that it will survive my clay … but nothing ventured. In the autumn last year I started to add bulbs to this area. First Narcissus ‘Jet Fire’, which I used to have in my garden in Suffolk. Much-loved by my husband, Nick, who still (rather weirdly) remembers them fondly, although he is not really a ‘plant person’. The trumpet becomes much more orange as the flower matures. 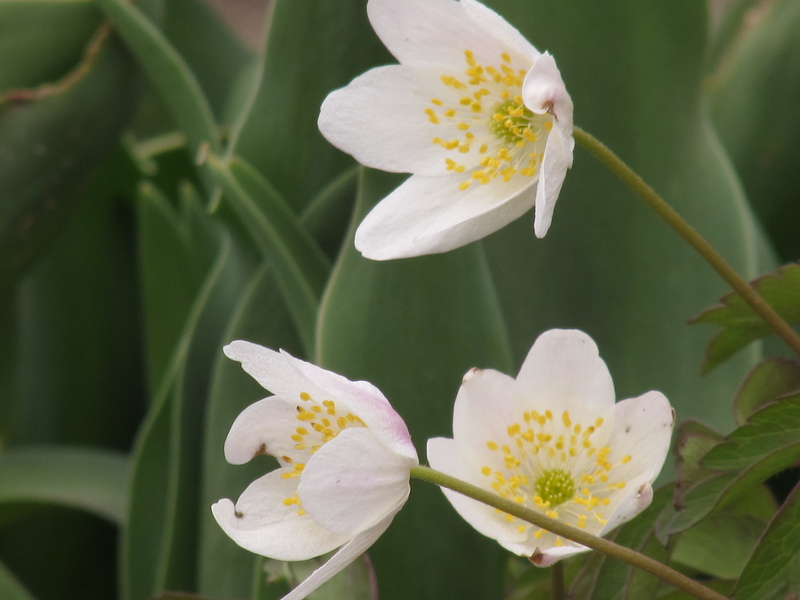 Also ‘Peeping Jenny’, presumably deemed to be a kind of mix of the best characteristics of white ‘Jenny’ and old ‘Peeping Tom’. 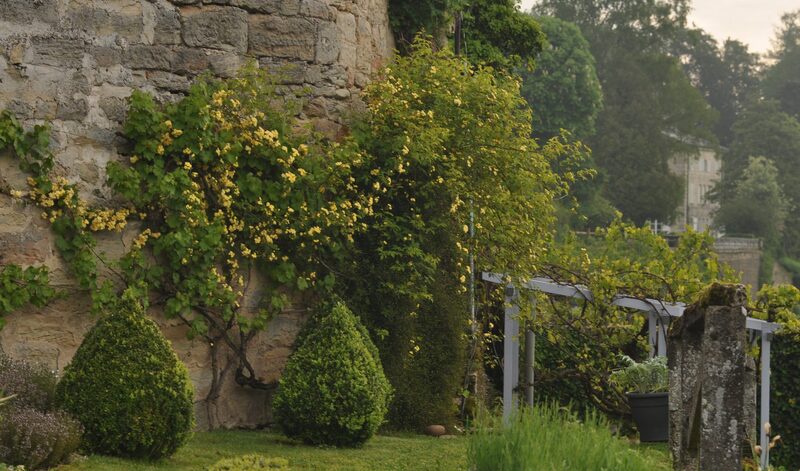 I love ‘Jenny’, who I wanted to add to the Rose Walk this year for her white flowers. I was too late to order and bought this yellow trumpet version instead. 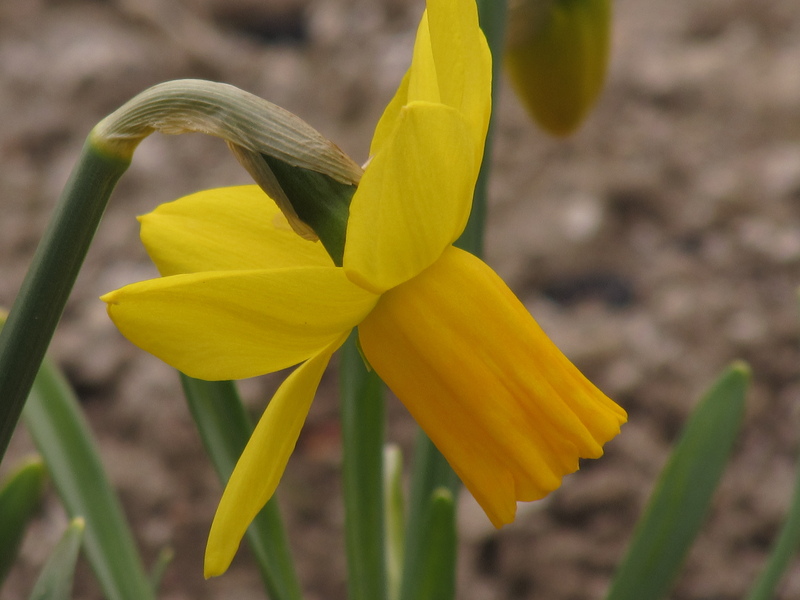 A beautifully shaped daffodil. Then there were bluebells (taking liberties, because Hyacinthoides non-scripta is not native to this part of France). The foliage just appearing now. And, yes, Nick – we now have fritillaries! 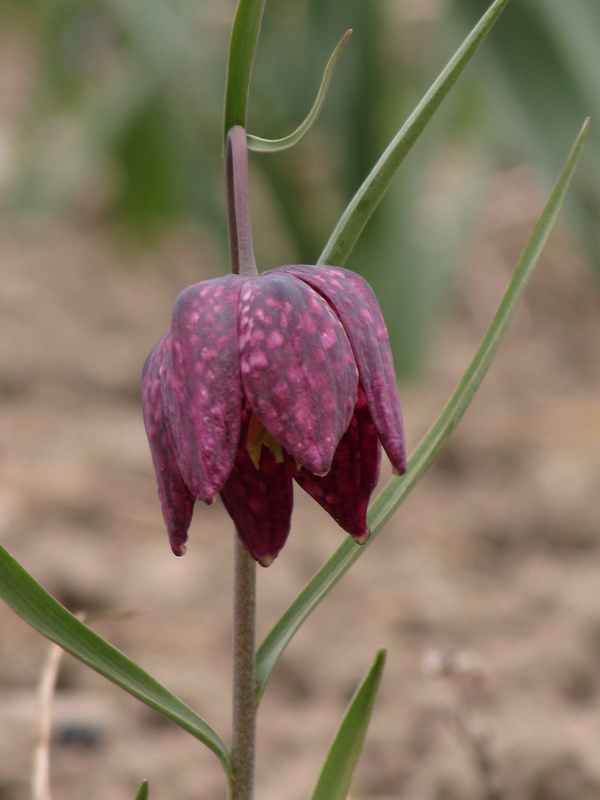 We thought Fritillaria meleagris would be perfect for the ground low down in the garden near the river (we do dream a lot – hence the blog’s name – and Nick and I visited nice wild colonies together in Suffolk). The 15 purchased in 2014 (only 3 have flowered) is my start, hopefully to raise more from seed for eventual naturalising. In the same area are what I now call ‘Beatrix’s anemone’. A dear friend in Basel who visited in 2012 presented me with bags of hostas (all still alive Beatrix!) and this little Anemone nemorosa came along for the ride. Wonderful to have such a plant-rich garden that little sweeties like this hitch a ride when you give something away. 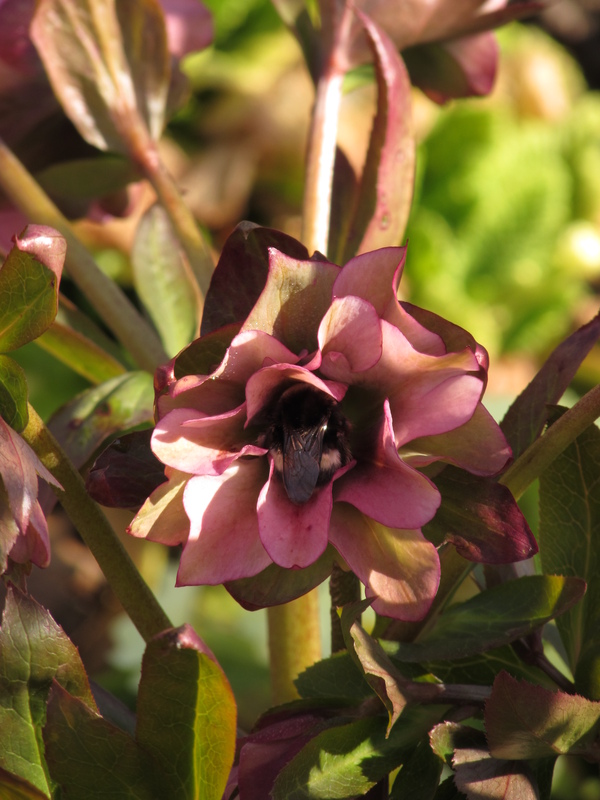 This week there was a sleepy bee on one of my Hayloft Plants hellebores, drunk in the warm sunshine (the bee, not the hellebore). 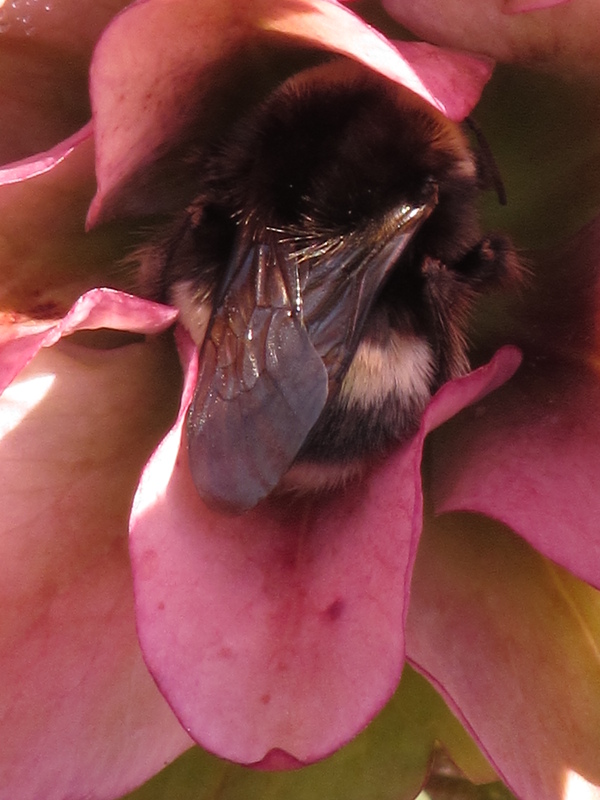 Odd that it was a double flower – I thought pollinators didn’t like doubles? It lay inside that flower for such a long time that I thought it was dead, so I nudged it gently. It buzzed drowsily and was gone the next day. The hellebore wasn’t supposed to be double (it’s one of Hayloft’s ‘Pretty Ellen’ series), but I’m charmed regardless. The Rose Walk is at one of its nicest stages, in my opinion. 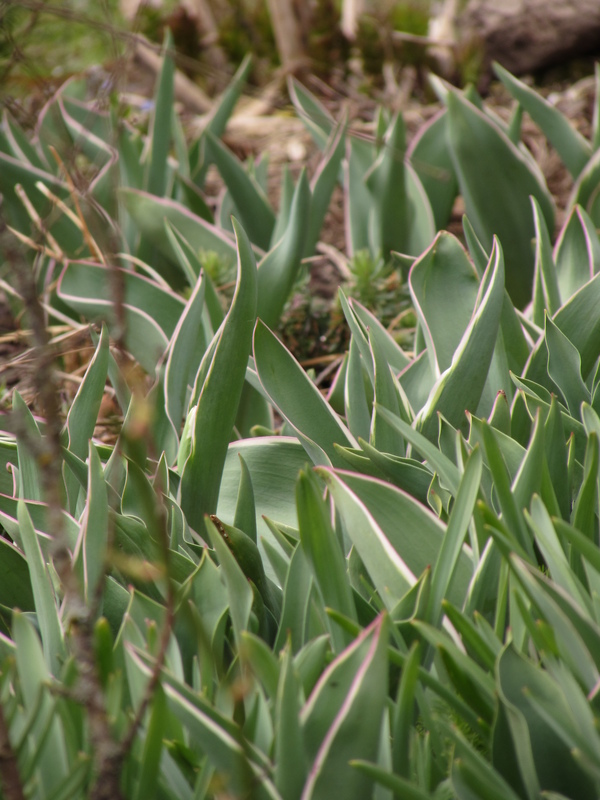 Lots of allium and tulip foliage pushing through. Unfortunately I spent so much on other bulbs last autumn that I’d not really money in the budget to add to my plantings of ‘Queen of the Night’, ‘Sorbet’ and ‘China Pink’. I suspect the display will be rather disappointing, but they should come back again a bit next year after their ‘year off’, since they are amongst the most persistent of tulips. It will be interesting to see how many flowers they have in their second/third years without adding to them, as I originally planned. Further on down the Rose Walk I did add this tulip with the pretty white edge to the leaf, ‘Sweet Impression’. When we first moved here I had many, many bulbs in pots that I had raised from Alpine Garden Society seed. They had followed us from England to Ireland, to here. Many were killed in the first hard winter because I didn’t plunge them properly. The fritillarias and the cyclamen were the saddest loss, but the survivors are sweet, and just starting to flower now. Narcissus pseudonarcissus. 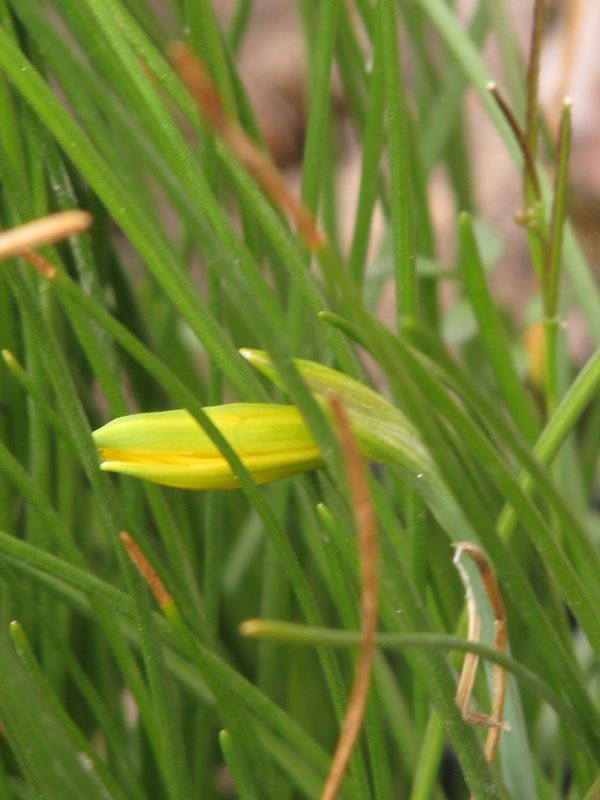 I thought this was the Tenby daffodil (N. pseudonarcissus subsp. obvallaris, but it doesn’t look right with those pale-yellow petals. Perhaps simply N. pseudonarcissus, although I can’t imagine why I wanted to grow it from seed. 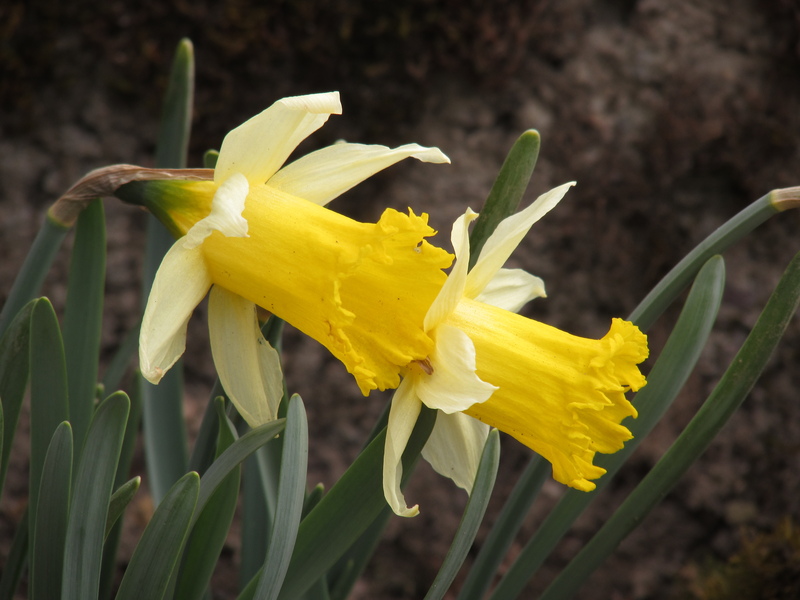 Narcissus bulbocodium – hurrah! The first flower … On the banks right next to the Rose Walk where the hazels live I’ve managed to get foxgloves going as well as Angelica sylvestris and Hesperis matronalis from Hardy Plant Society seed. The last swamped all the roses in their first year, but I’ve persuaded it to migrate onto the slope were it will still partner without threatening. And finally, something else that came in under a different name. 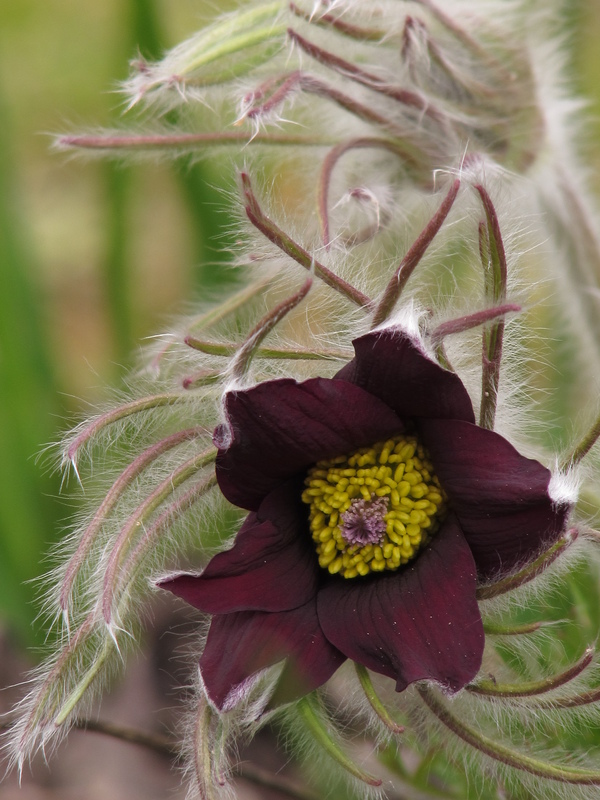 This was supposed to be Calamintha nepeta, but is clearly Pulsatilla vulgaris. 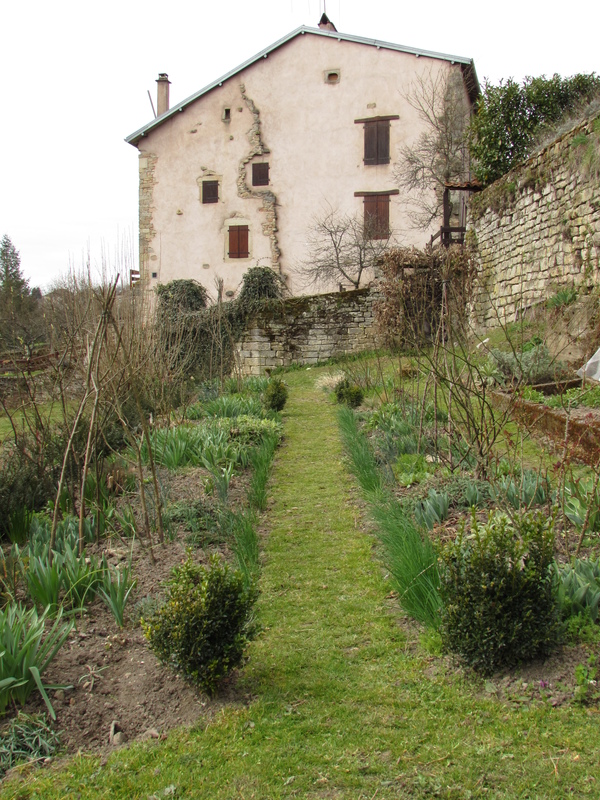 I’m pleased because I know it did well on the clay of a previous garden and will increase easily from fresh seed. 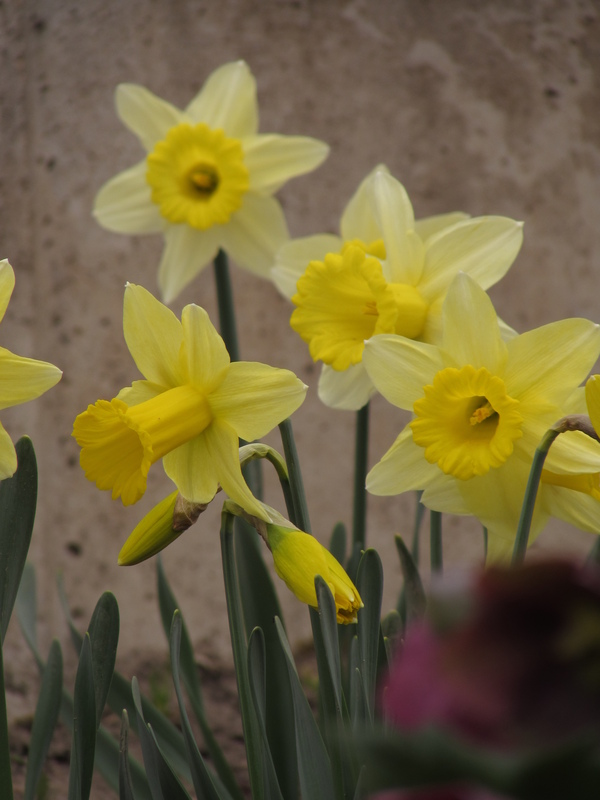 This entry was posted in Box Blight, Bulbs, corms, tubers & rhizomes, Garden development, Good things this week and tagged Box blight, Bulbs, corms, tubers & rhizomes, Knot garden, Narcissus, Tulips on March 28, 2015 by Cathy.